What are the misspellings for wear? What are the common mistypes for wear? 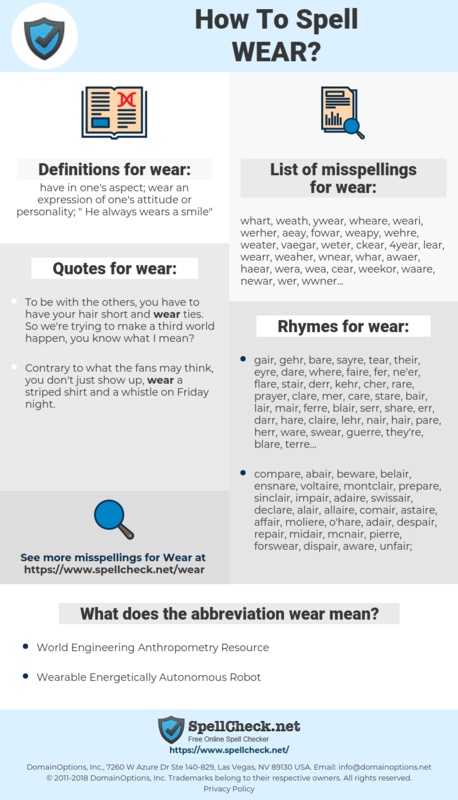 What is the definition of wear? What does the abbreviation wear mean? What are the quotes for wear? What are the rhymes for wear? What are the translations for wear? 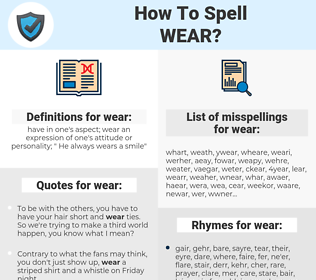 What are the common typos for wear? This graph shows how "wear" have occurred between 1800 and 2008 in a corpus of English books. Contrary to what the fans may think, you don't just show up, wear a striped shirt and a whistle on Friday night. I've been designing since I was 8. I started sketching dresses I could wear when skating. I was always involved in all aspects of skating, not just the technique, the choreography, the music, but the visual aspects, too- what I should wear. 耐磨, 穿着, 佩戴, 身穿, 穿带, 披挂. tragen, schwinden, abtragen, Abnutzung, Verschleiß, verschleißen, abnutzen, anhaben, Kleidung, Abrieb, User, Abrasion, sich abnutzen, Porter. 磨耗, まとう, 纏う, かぶる, ちゃくする, 冠る, ひっぱる, うがつ, きつける, 被る, おびる, 穿つ, 引っ張る, 佩びる, 引っぱる, 着付ける, 著する, めされる, まもう, 衰える, よろう, 引張る, 身に着けている. portar, trazer, calçar, estragar, trajar, levar vestido. ponerse, colocar, llevar, utilizar, uso, traer, ropa, deterioro, desgaste, usar, gastar, consumir, deteriorar, vestir, lucir, llevar puesto.